Your vehicle uses a roof antenna to receive AM or/and FM broadcast signals. This antenna is removable. To remove the roof antenna, turn it counterclockwise. To install the roof antenna, turn it clockwise. 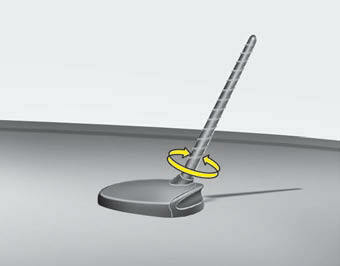 Before entering a place with a low height clearance or a car wash, remove the antenna by rotating it counterclockwise. If not, the antenna may be damaged. When reinstalling your roof antenna, it is important that it is fully tightened and adjusted to the upright position to ensure proper reception. When cargo is loaded on the roof rack, do not place the cargo near the antenna pole to ensure proper reception.